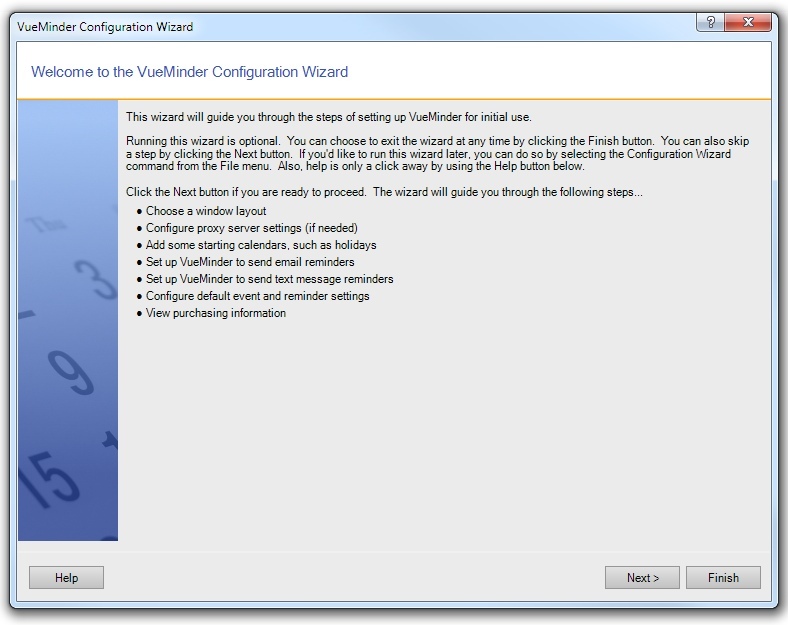 The Configuration Wizard will automatically run the first time VueMinder is installed. Click the "Configuration Wizard" command on the File menu. The first time VueMinder is started (or after upgrading from the Lite version), a Configuration Wizard will run. This wizard helps guide you through setting up VueMinder for initial use. The first screen, shown below, is simply a welcome message explaining what the Wizard does. You can close the wizard by clicking the Finish button. It will not run again unless commanded from the File menu. To advance to the next screen, click the Next button. To return to a previous screen, click the Back button. All the settings that can be entered through the wizard can also be found in various locations of VueMinder, such as the Options window and the Calendar Properties editor.